DETROIT – They were drafted together. Now they’ll ride into hockey immortality together. On Monday, the Hockey Hall of Fame announced that Nicklas Lidstrom and Sergei Fedorov, teammates for 12 seasons during the Red Wings’ resurgence to Stanley Cup glory, are among the latest inductees for enshrinement later this year. The Wings teammates, both drafted by Detroit in 1989, will be inducted – along with Chris Pronger, Phil Housley, Angela Ruggiero, Peter Karmanos Jr. and Bill Hay – during a Nov. 9 ceremony in Toronto. Lidstrom, Fedorov and Pronger each was chosen in his first year of eligibility. Lidstrom, 45, retired having won the Norris Trophy seven times, the Stanley Cup four times and an Olympic gold medal for good measure. In his 20-season NHL career, Lidstrom produced 1,142 points in 1,564 regular-season games. He is sixth all time in points among defensemen. He was the first European player – -born and trained – to win the Conn Smythe Trophy, doing so in 2002, and he was first to captain a Stanley Cup champion, in 2008. A member of the elite Triple Gold Club, Lidstrom won gold medals while playing for Sweden at the World Championships in 1991 and the 2006 Turin Olympics. He represented Sweden four times in the Olympics. Still, with such a large portfolio to choose from, Lidstrom said it’s difficult to pinpoint one career highlight as his favorite. The impending inductions of Lidstrom and Fedorov brings the Red Wings’ count to nine enshrined players –Larionov, Steve Yzerman, Chris Chelios, Dominik Hasek, Brett Hull, Luc Robitaille and Brendan Shanahan – off their 2002 team that defeated Carolina in the Cup finals. Fedorov played 13 seasons with the Red Wings, before capping an 18-season career with stops in Anaheim, Columbus and Washington. He registered 483 goals and 1,179 points in 1,248 games. Now 45 years old, Fedorov won the Hart Trophy as league MVP following a spectacular 1993-94 season. He also won the Selke Trophy twice (1994, 1996) as best defensive forward, and three Stanley Cups as the central figure in the Red Wings’ Russian Five. 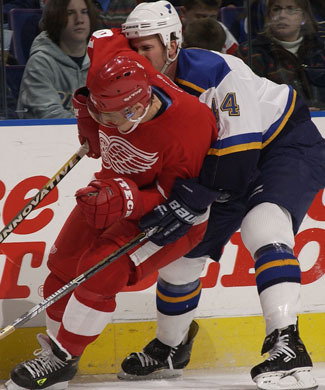 A tremendous athletic and excellent skater, perhaps the best the game has ever seen, Fedorov was poetry on ice. Fedorov legend only grew stronger when, out of necessity with mounting injuries along the blue line, he changed positions at Bowman’s urging.